Last fall I told our son that while old fashion, I wanted a Bundt Pan. I had been listening to an interview about Nordicware, the company, and thought it might be a nice addition for last minute dinner parties. I'm thrilled to tell you that he gave me one for Christmas. Growing up in Minnesota, I'm familiar with the company but have had no need for a Bundt Pan, just one of the many products they make. What I didn't know was that the Bundt pan was invented by David Dalquist in 1950, the co-founder of Nordicware. While not important to juggling professional commitments with midweek entertaining... it's a fun fact worth sharing. In the baking community, Bundt's are having a moment. It's likely a second, or third round of popularity and I'm happy to join the fun! Over ten days in January we hosted three dinner parties, creating the perfect opportunity to try making a Bundt. Deciding to test the recipe below before a serving it to guests... I was mostly interested to see how easy the cake released from the pan. I didn't know about the 'batter secret' so it didn't rise even but that issue had to solved before serving this to guests. A quick Google search taught me to grease the pan well and draw the batter towards the outside edge before baking. After removing the pan from the oven, loosen the edges and let cool for 15 minutes before flipping onto a cooling rack. Let sit until cool, and it will slip right out of the pan. Any uneven rise will settle while cooling. The night of the dinner... We had an wonderful evening, sharing stories, laughing, and getting to know each other. Whether or not the Bundt was a new experience for our guests from Brazil remains a mystery, but this dessert was a home run! I wasn't able to find fresh cranberries so I opted for no sugared cranberries as a topping. Recipe found at Tutti Dolci. Preheat oven to 350°F and spray a 10-cup bundt pan generously with nonstick spray. Whisk together flour, baking powder, baking soda, and salt in a medium bowl; reserve one tablespoon flour mixture to toss with cranberries. Combine sugar and orange zest in a food processor and pulse for 1 minute; combine with butter in a large mixer bowl and beat on medium speed until pale and fluffy. Reduce speed to low and add eggs one at a time. Combine buttermilk, orange juice, and vanilla in a small bowl. Beat in flour mixture in three additions, alternating with buttermilk mixture (begin and end with flour mixture), just until incorporated. 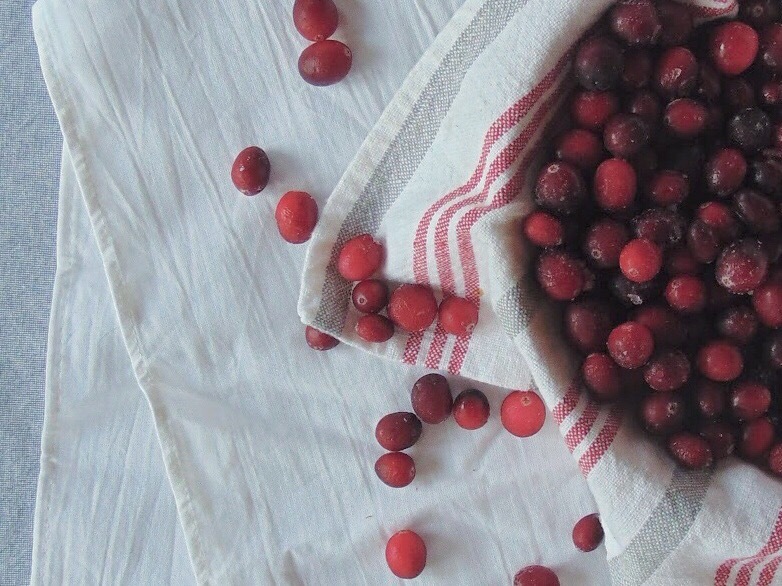 Toss cranberries with reserved flour mixture and gently fold into batter. Spoon batter into prepared bundt pan and smooth with an offset spatula. Tap pan sharply to reduce air bubbles. Bake for 50 minutes, until cake is golden, springs back to the touch, and a tester inserted in the center comes out clean or with a few crumbs attached. Cool in pan on a wire rack for 15 minutes; carefully invert onto rack and cool completely. For the glaze, whisk together powdered sugar, salt, and orange juice in a small bowl. Drizzle glaze over cooled cake and serve. Store leftovers in an airtight container at room temperature. Note: I replaced half of the butter with apple sauce, and used frozen cranberries. Both of these adjustments worked perfect. I love using apple sauce with cakes. Not only is the fat cut in half, it makes for a very moist cake.